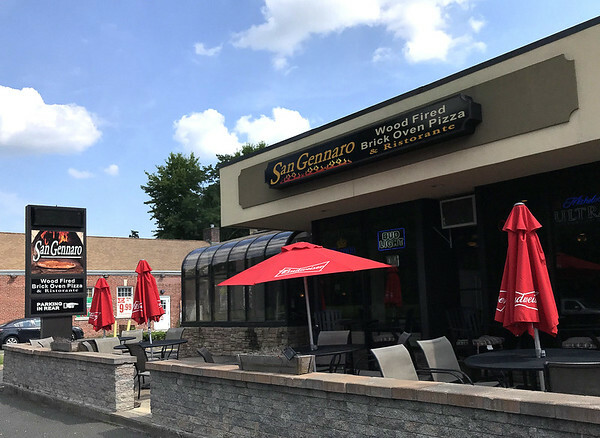 BRISTOL - San Gennaro Wood Fired Brick Oven Pizza and Restaurant makes fine Italian cuisine like no one else in the area. “We’re the only one around with a wood brick oven,” said Manny Walia, manager at San Gennaro. San Gennaro’s menu features a number of Italian favorites, including fried calamari, fried clams, antipasto, garlic bread and pasta e fagioli. Its grinders include meatball, eggplant, sausage and peppers, chicken cutlets and many others. Pizza toppings range from prosciutto, arugula, peppers and mushrooms to spinach, garlic, bacon, mozzarella cheese, clams, pepperoni and others. Entrees are fine Italian dishes featuring fish, pasta and prime rib, Walia said. The restaurant also has a number of specials on Fridays and Saturdays and a regular special Monday through Thursday. For $50, Monday through Thursday, two people can share an appetizer, a soup or a salad, each get their own entrée and share a dessert and a bottle of red or white wine. The restaurant has a large selection of red and white wines. Walia said San Gennaro also has a very friendly, great staff. San Gennaro, at 22 East Main St. in Forestville, is open Sunday through Wednesday, from 11 a.m. to 9 p.m., and Thursday through Saturday, from 11 a.m. to 10 p.m. The restaurant has an active Facebook page on which customers can see specials and promotions. For more information on San Gennaro, visit its website at . Posted in The Bristol Press, General Business, on Tuesday, 14 August 2018 21:29. Updated: Tuesday, 14 August 2018 21:31.